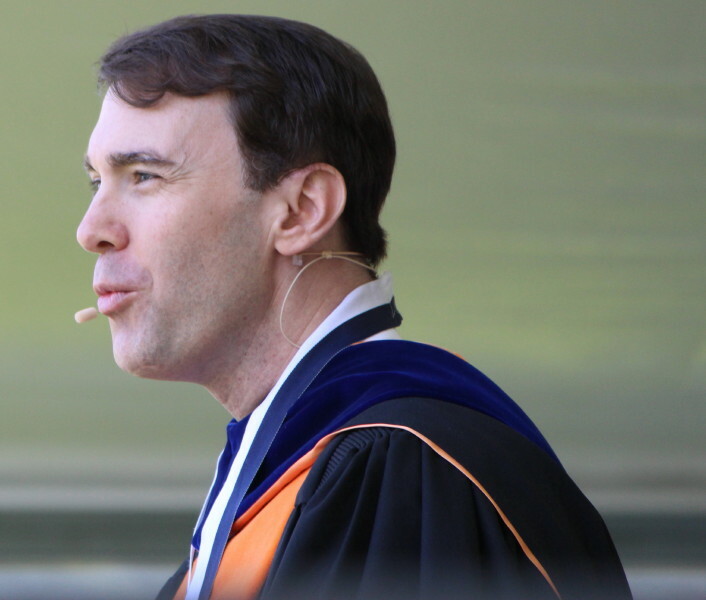 (Wenham) Today Julie and I continued our tradition of going to Gordon College graduations. 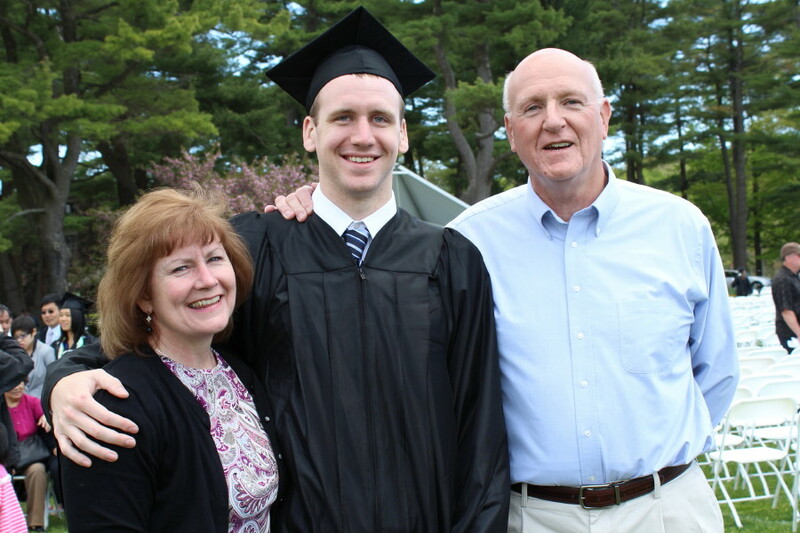 That tradition offers us a special chance to be with the men’s basketball graduates as well as their families. Over the course of four years, and many games, they all become part of our extended family. 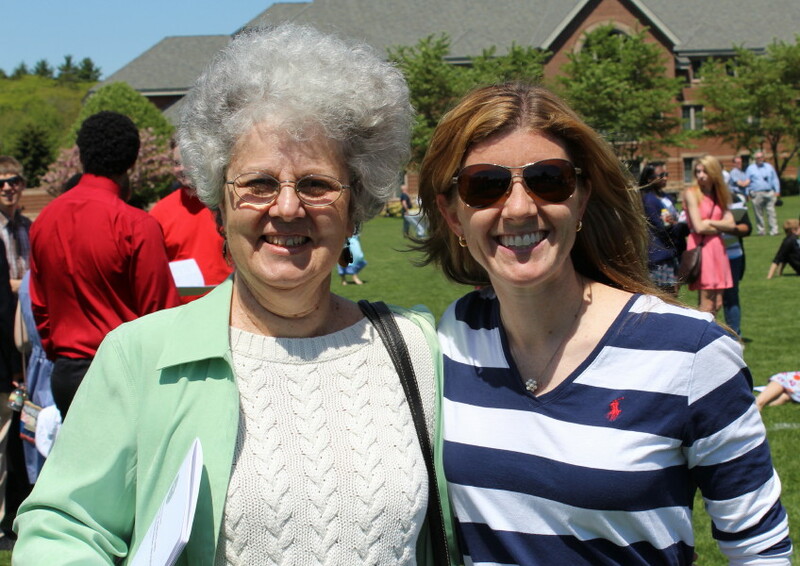 The weather was totally cooperative for the two-hour event……bright sun early and a cooling breeze later. 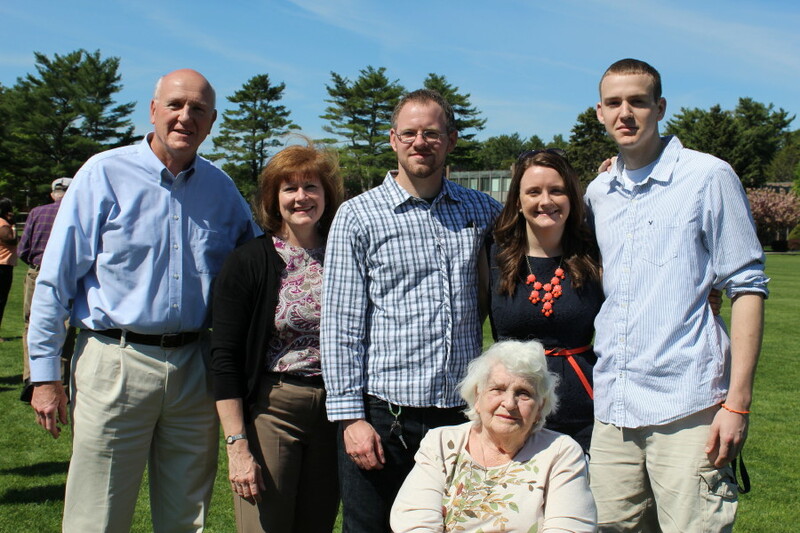 GC basketball players Jordan Kelly and David Dempsey are both in the Class of 2013 so I picture stalked them and their families. The photos included don’t have too much order to them and some of you may not even know who some of these folks are. 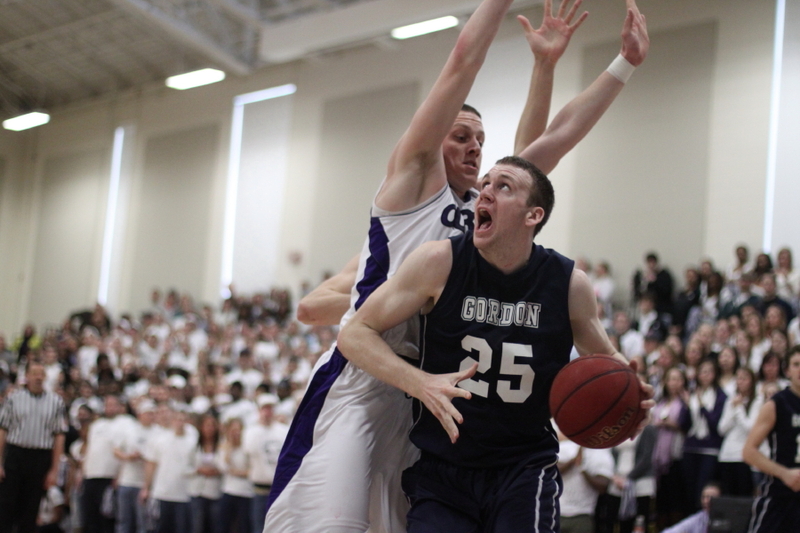 The normal connection is Gordon College men’s basketball. 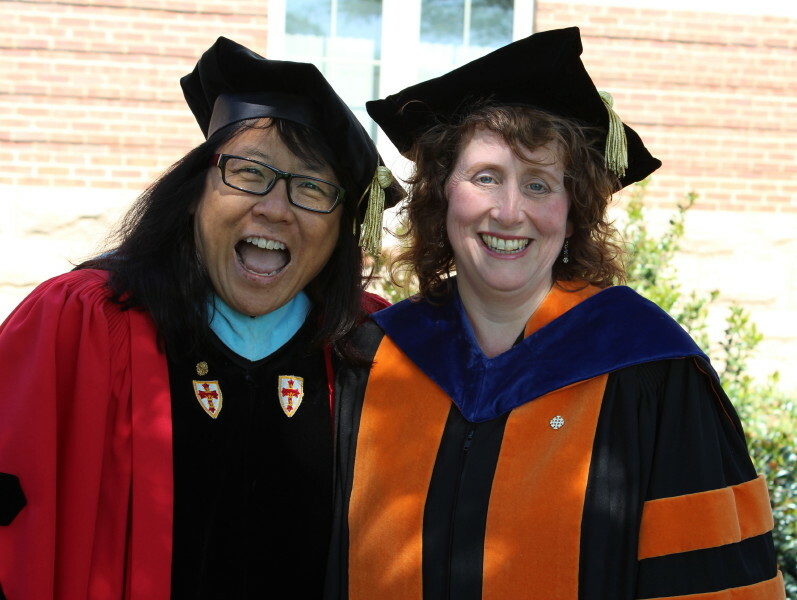 There was another reason for my being on campus today – 50th class reunion. 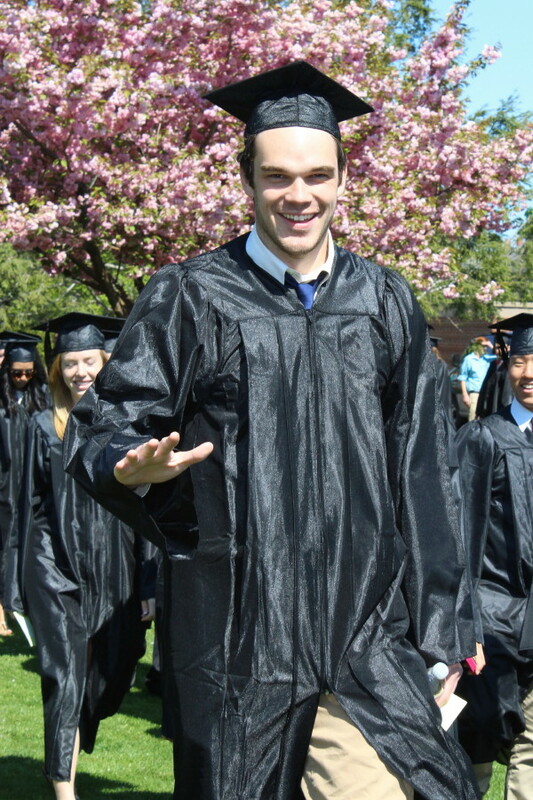 A lot has changed since my one year in Drew Hall and my three years in Hilton House. Back then the Bennett Center was a maintenance barn. The soccer/baseball fields have become a parking lot and a dorm. I will admit that in the pictures that include Adam/Stephen Herod I chickened out trying to guess which one was which. Where are the name tags? Gordon had three tries against Curry this season and couldn’t get the job done in any of them. 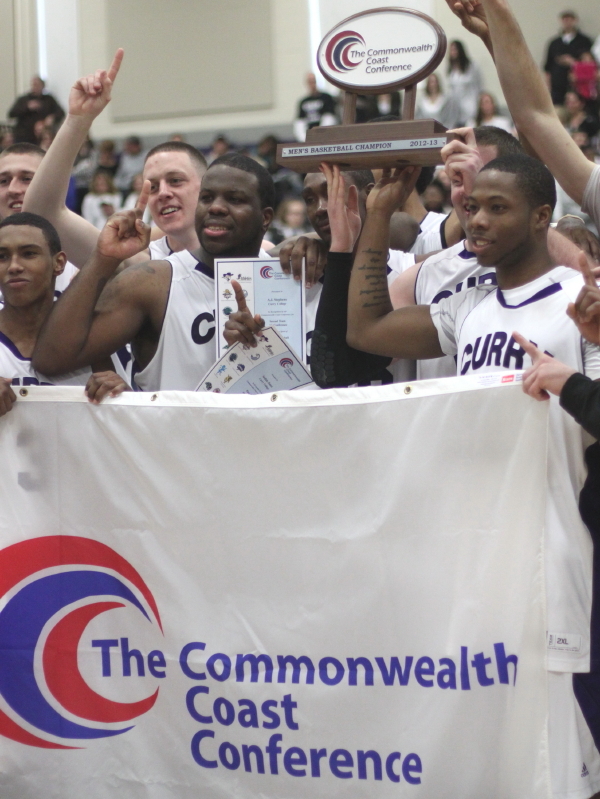 Their last try-and-miss was in the Commonwealth Coast Conference tournament final held today at Curry. On this afternoon, neither team played very well. Blame the championship-game tension. 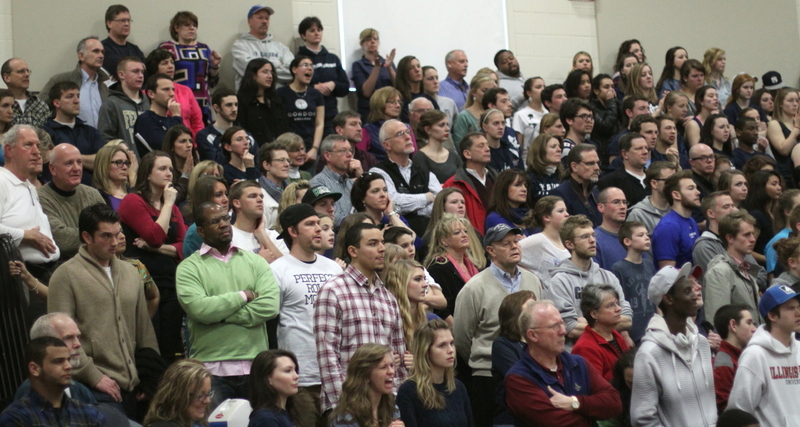 Blame the noise that a crowd of 1,100 can generate. Whatever, it wasn’t what you would have expected from the top two seeds. Gordon spent most of the game trying to catch up. Curry broke free from an 8-8 tie seven minutes into the game and never trailed. The Colonels would boost their advantage to double figures in the first half. Their lead at halftime was, 32-22. The Scots put a 7-0 run together (Park Thomas layup, Taylor Bajema three, and Luke Hamilton layup) in the second half to cut the margin to six (39-33) with fifteen minutes to go. Plenty of time to complete the comeback but that good Gordon segment was followed by a missed layup and two missed free throws. 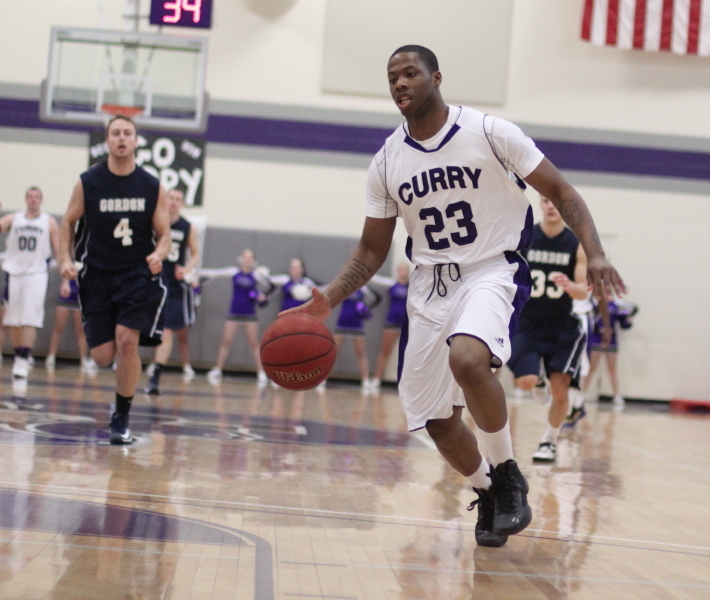 Before you knew it Curry was ahead by ten, 45-35, and the Scots were back chasing again from a distance. The lack of consistency on defense and offense separated Gordon from the title. Poor foul shooting was the first thing that came to my mind as the primary cause of the loss. But then I checked the online stat sheet and saw that both teams missed ten free throws. The Scots made 8-of-10 foul shots during the last five minutes, including five straight at the end. Curry was even better from the charity stripe in crunch time. Within five (61-56) and only 1:20 left, the Scots were clearly in the steal-or-foul mode. The steals didn’t happen so the Scots fouled the Colonels on each of the next four possessions. Curry calmly drained seven straight before an AJ Stephens miss. Lambros Papalambros hit two, Carlos Ribeiro four, and AJ Stephens one. Very simply, when foul shots had to be made, the Colonels were up to the challenge. The best offensive players in the game were Sedale Jones (23 points) and David Dempsey (22 points). Both of them had excellent stat lines: Sedale – 23 points, 9 rebounds, 3 steals, 2 blocks, 1 assist. David – 22 points, 12 rebounds, 1 assist. Sedale achieved the top offensive efficiency rating with +26 and David was second with +22. These two seniors will be sorely missed by their respective teams. How did Curry win? Once they took the lead they made enough shots to keep it. Defensively, they took away Gordon’s inside game and played strong perimeter defense to lessen good looks. The wildcard was AJ Stephens. His size and mobility required help defense which limited him to ten points on 2-for-13 shooting. But five times he passed out of the coverage to weak-side cutters for layups. Why did Gordon lose? Their good shooting of recent games took a big step backwards. The Scots had shot over 50% during the past five games, all part of the nine-game winning streak. However, against Curry their field goal percentage was only 40% (22-for-54). To get that percentage up to 50%, Gordon would have needed to make five more baskets. In a game you lose by six points, you can see where those five baskets would have gotten you. The crowd was terrific. Plenty of cheering. Plenty of chanting. Gordon sent a busload of fans. The best response to a chant was by the Curry crowd. When Sedale Jones put up a shot that missed everything, the Gordon crowd started in with, “Air ball, Air ball,” as they had done to Ryan Palumbo of Roger Williams and Derek Mayo of Wentworth. However, Curry answered the Gordon chant with, “MVP, MVP.” Sedale was the CCC’s MVP. 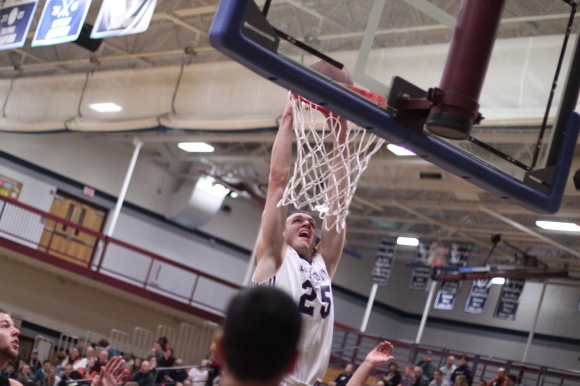 In the biggest game of the season, Taylor Bajema had one of his best games. He came in third in the offensive efficiency rating (+16). The sophomore had eleven points, five rebounds, three assists, and missed only one shot. Remarkable season for Gordon. The Scots were 5-4 in the 2012 part of their season before dazzling us with 16-3 record in 2013. They were consistently good with different players stepping up in different games. They went from the team that found ways to lose to the team that found ways to win. David Dempsey struggled during the 5-4 part of the season with a broken nose and the resulting distracting mask. 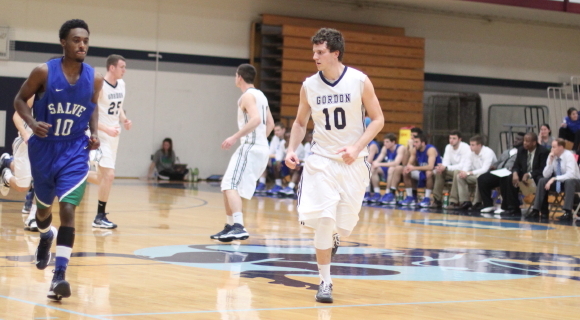 Once the new year rolled around (minus the mask) he was, well, David Dempsey………effort, rebounds, and points. The talented senior managed to score his way up to seventh place in Gordon’s all-time scoring list with 1,463 career points. Along the way there was never a hint of anything less than 100% effort. 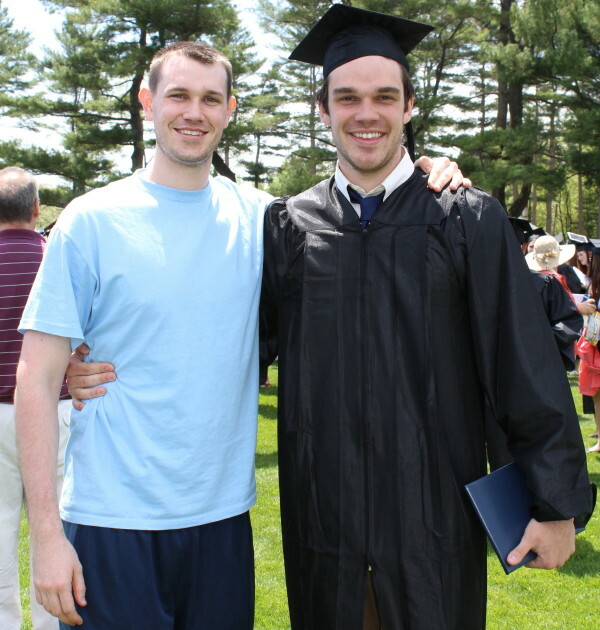 Seniors David Dempsey and Jordan Kelly won’t be part of the 2013-14 team but the rest of the team will be back. That bodes very well for next year’s team. There surely will be high expectations but hopefully the 2013-14 team doesn’t forget what happened to last year’s CCC champion Endicott team. The Gulls had most of their championship team back and the CCC coaches picked them to finish first……..they didn’t even make the tournament. 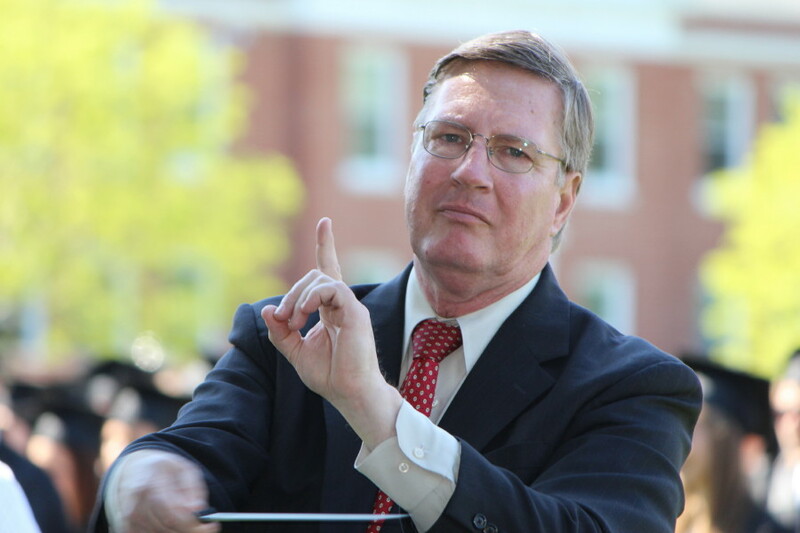 Plenty of credit for the terrific season goes to the coaching job done by Tod Murphy. The Scots won twelve more games than last year including six more in the conference. His role in helping Hans Miersma develop into one of the best interior players in the conference was substantial. This finishes my eleventh year attempting to cover the Gordon men’s basketball games. I have greatly enjoyed the coverage part as well as the opportunity to interact with others who support the Gordon team. Lord willing, I expect to be back on board in November of this year. Special thanks to my wife, Julie, for encouraging me to cover the games and for becoming one of the team’s biggest fans. Don’t get her started on missed foul shots or referees! The Offensive Efficiency Rating number is arrived at by subtracting the bad stats (missed field goals, missed free throws, turnovers) from the good stats (rebounds, points, assists, blocks, steals). 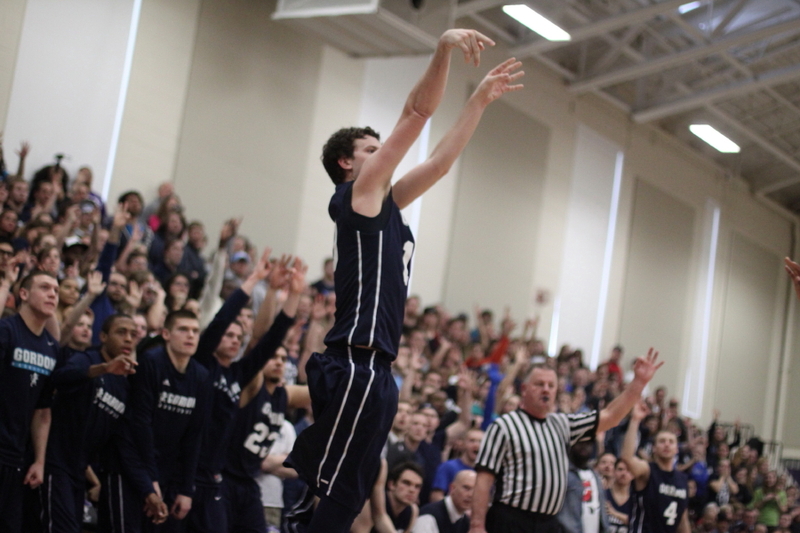 (Wenham) Roger Williams did a pretty good job of taking away Gordon’s inside game – Hans Miersma six points, Jason Dempsey two points. But that good interior defense left openings elsewhere and the Scots “elsewhere” players were on from beginning to end and the home team never trailed. All that great offense enabled Gordon (20-6) to defeat Roger Williams, 81-59, before a big crowd on Tuesday night to advance to the Commonwealth Coast Conference semi-finals against Wentworth on Thursday at the Bennett Center. The Scots have now won eight straight and thirteen of their last fourteen. To say that this team is rolling, may be an understatement! 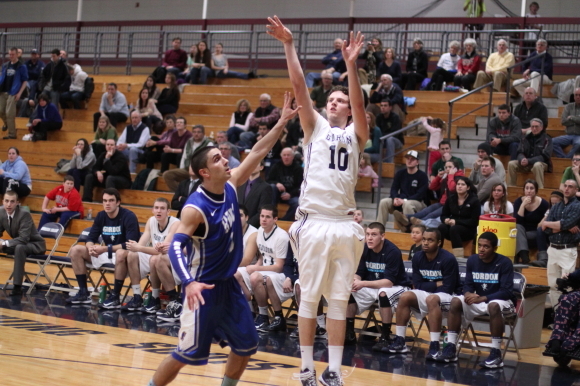 Six players reached double figures for the Scots against Roger Williams led by David Dempsey (20 points). David was named to the CCC first team today. Gordon had nine three’s in the game. 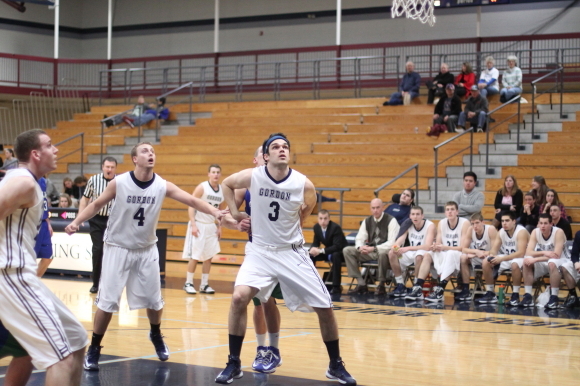 Luke Hamilton (16 points) had three of them in the first 5 ½ minutes as the Scots bolted to a quick, 17-4, start. The Hawks (10-16) cut the lead to four in the first half (19-15) and in the second half (41-37) led by Ryan Palumbo (20 points), Adam Cook (15 points), and Mike Engelmann (12 points). But the Gordon offense was never shut down for very long. The #2 seed shot over 50% for the game and was a very warm 9-for-17 from long range. 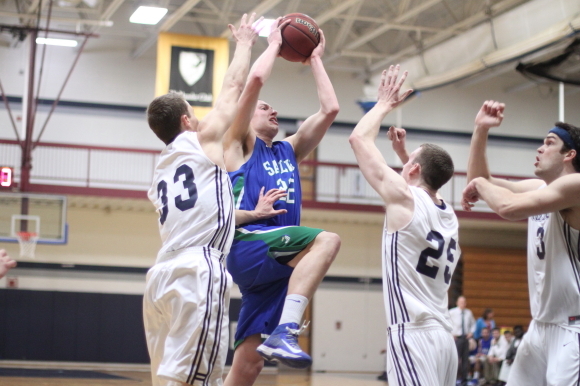 The Scots were 6-for-6 from beyond the arc in the second half. After the Hawks closed to 41-37, Gordon put a 10-2 segment together over the next 3 ½ minutes and stretched their advantage to twelve (51-39) with 13:09 to go. 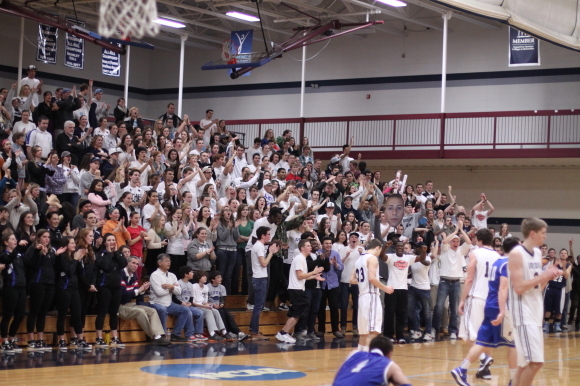 The visitors from Bristol (RI) were never able to get inside double-figures the rest of the way. That decisive 10-2 run featured three’s by Park Thomas (16 points) and Taylor Bajema (10 points) plus a layup and jump shot from David Dempsey. Park and Taylor were huge in the second half. 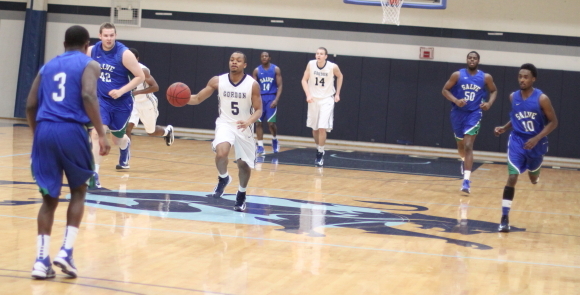 Park had all of his points (16) in the second half as well as five assists. Taylor scored all of his points (10) after the break and added five rebounds. Park had a season-high nine assists. Luke Hamilton’s sixteen points are a season high for him. His long-range shooting (18-for-23) has been unbelievable over the last five games. 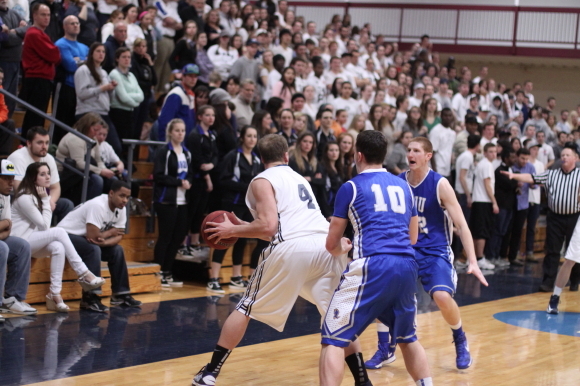 The best matchup to watch was at the point guard position where sophomore Ryan Palumbo and Park Thomas operate. Both players earned honorable mention when the CCC All-League teams were announced today. 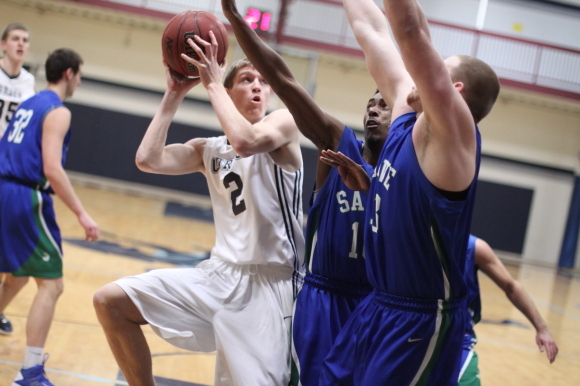 Hans Miersma was named the Defensive Player of the Year by the CCC and landed on the All-League second team. Hans had plenty of blocks during the season. His 6-9 presence in the lane has turned more than a few drivers into passers or outside shooters. The advance to the semi-finals is an improvement from the last two seasons when the Scots bowed out in the first round. Thursday night’s opponent, Wentworth, did it to Gordon last year. 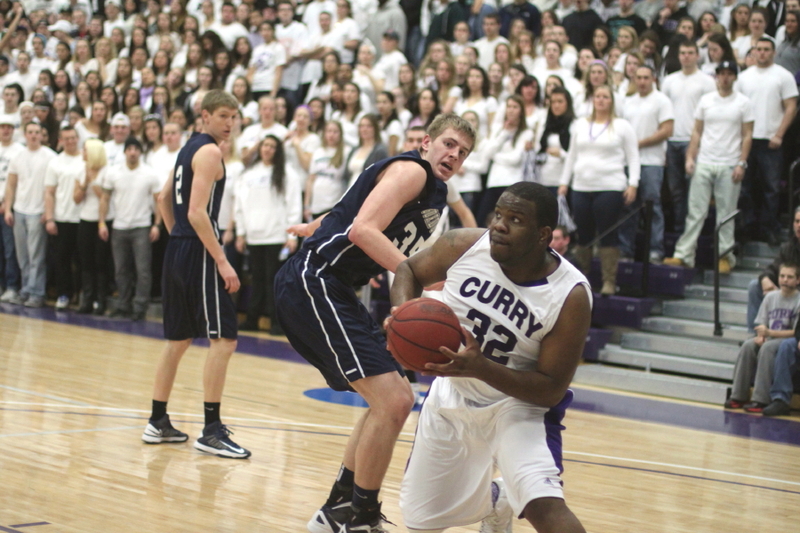 Curry and Eastern Nazarene get together in the other semi-final matchup. Is it too much to hope for a Gordon/Eastern Nazarene battle for the CCC title on Saturday afternoon at the Bennett Center? Thought so, let’s just concentrate on Wentworth on Thursday night. 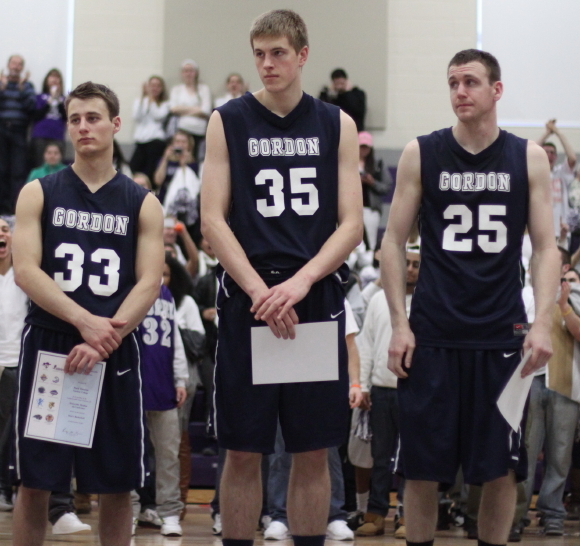 (Wenham) Gordon finished a 19-6 regular season with a narrow, 86-83, win over Nichols on Senior Day on Saturday afternoon at the Bennett Center. 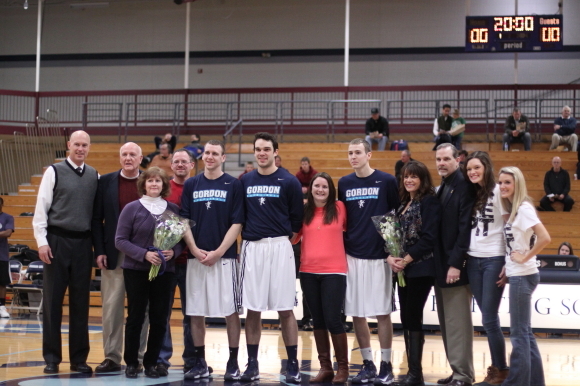 Seniors David Dempsey and Jordan Kelly and their families were honored before the game. The Scots 14-4 Commonwealth Coast Conference record earned them the #2 seed in the post-season tournament. 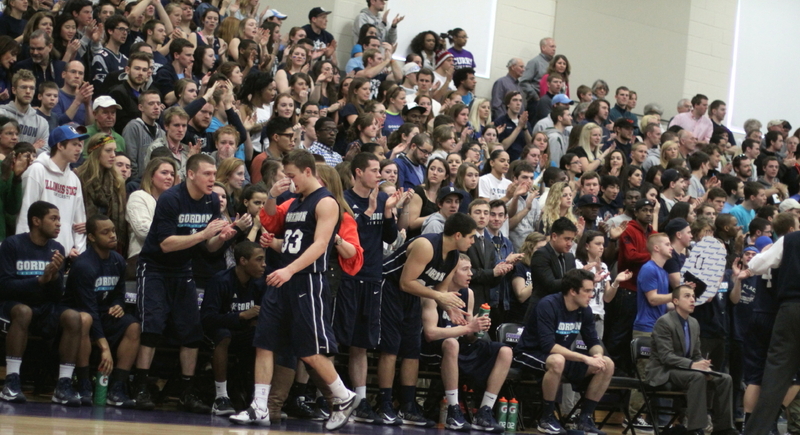 They will host #7 seed Roger Williams (7-11) on Tuesday night (7PM) at the Bennett Center. 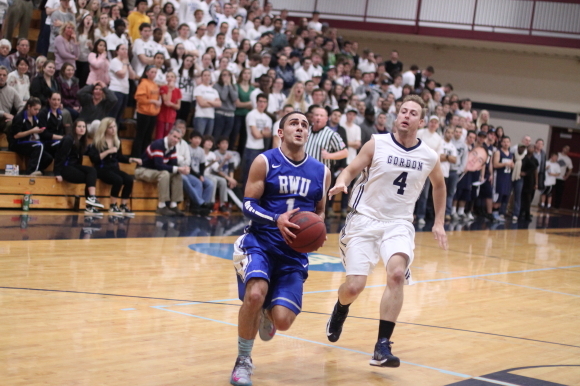 Gordon defeated RWU twice during the regular season. In one of those victories Alex Carnes went off for thirty-nine points. However, those previous stats versus the Hawks should be disregarded. In most tourney games, the defense gets a lot tighter and the pressure builds. Meanwhile, back to the game you thought you would read about, the Scots led from start to finish but nearly gave this one away after having a twenty-point (74-54) lead with 9 ½ minutes left. The Bison (13-12) got to within one point (84-83) with nine seconds left after a Christian Horton three. Gordon called a timeout and Coach Tod Murphy put Taylor Bajema into the game. That move paid off big-time. Taylor received the inbounds pass, got fouled, and swished both free throws to get Gordon a three-point cushion. 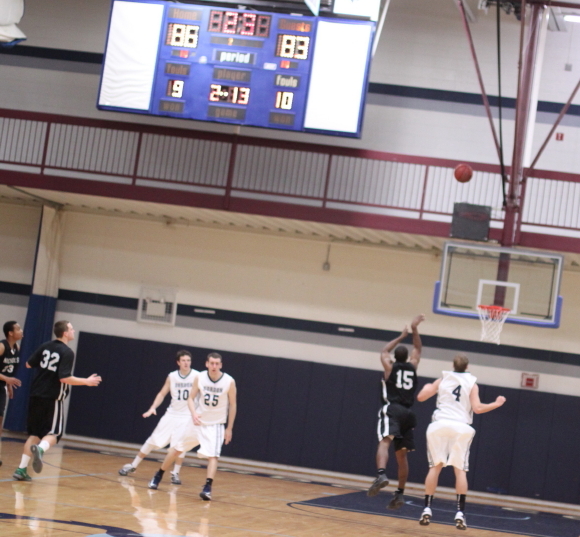 Freshman Irving Eggleston’s good-look, 3-point attempt, from the top of the key with two seconds left, missed. Overtime was avoided and the Scots had win #19. Gordon has won seven straight and twelve of thirteen. Those wins sure are nice but my most recent memory of the 2012-13 team will be of them getting outscored, 29-12, in the last 9 ½ minutes of the Nichols game. Chief culprit in the shaky finish? Turnovers. Seventeen in the second half. Three in a row to start the last 2:15. Close second culprit? Late-game free throws. 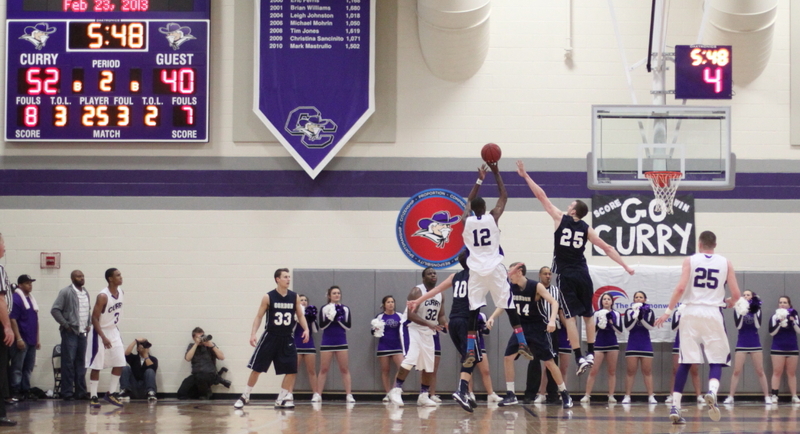 The Scots missed four-of-eight free throws in the last 2:45 of the game including the front-end of two one-and-one’s. Despite those two downers, the Scots played a terrific first thirty minutes. The shots were falling and the passing was as good as I’ve seen all season. Gordon led, 51-36, at the half. 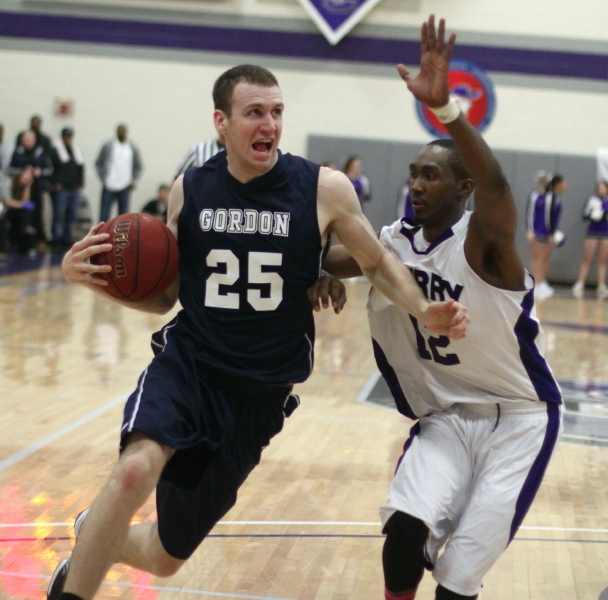 Gordon was credited with twenty-eight assists which was a season high and maybe a school record. I went back five years and saw nothing better. Park Thomas had eight assists which ties a season-high for him. He made a long bounce-pass down the lane to David Dempsey cutting in from the right that was a thing of beauty. 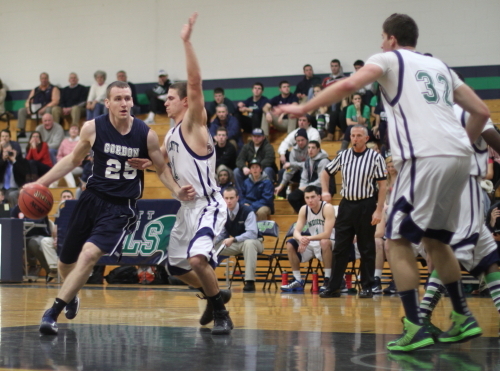 David Dempsey (23 points) led all scorers. He added six assists to offset six turnovers and ended up with an Efficiency Stat of +21. Part of the reason for that good number was eight rebounds, two blocks, and a steal. David had his sixth twenty-point game of the season. He had two dunks in this game. 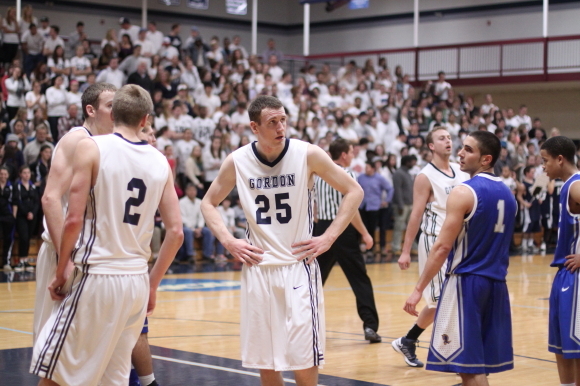 Luke Hamilton (15 points) had a season-high in points, making five 3’s. James Ek had a career-high eight points including two 3-pointers. One of the long ones had NBA distance. Alex Carnes ended up with thirteen points and a rolled ankle. 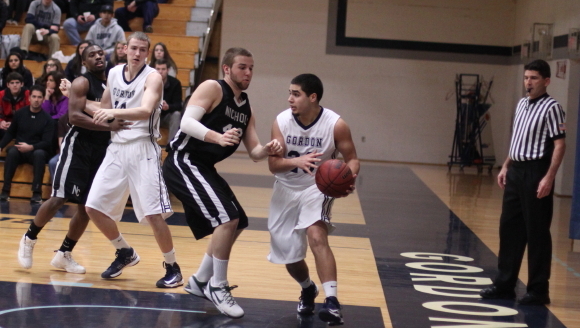 The Gordon faithful will certainly be hoping that Alex is back to full speed on Tuesday night against Roger Williams. The CCC’s top scorer (Ryan Sheehan) was limited to four points and had ice packs on his knees afterwards. 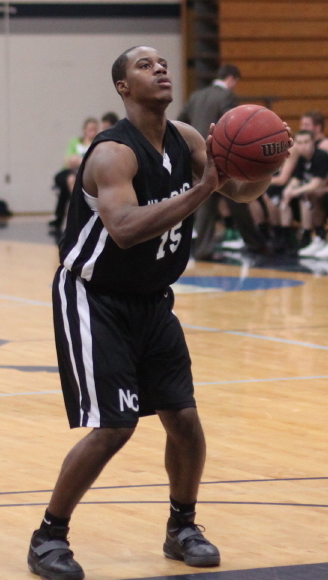 Nichols was paced in scoring by sophomore Matt Langadas (19 points) and freshman Irving Eggleston (18 points). The Bison had thirteen players put up points. My sense was that the visitors went heavy into their reserves after going down by twenty and it was the reserves who responded to make things very, very interesting over the last 9 ½ minutes. I noticed in the Bennett Center rafters that there is a nice space next to the 2009-10 CCC basketball championship banner. Is the 2012-13 team ready to fill that space? I like their chances. The teams that have defeated Gordon during the regular season (Curry twice and Western New England once) are in the other bracket. The Scots have twice defeated the teams (Wentworth, Roger Williams, Nichols) that are in their bracket. The 2009-10 championship team defeated Curry, 56-54, at the Bennett Center to win the title. A championship rematch with the same team would be in Milton since the Colonels are the #1 seed. 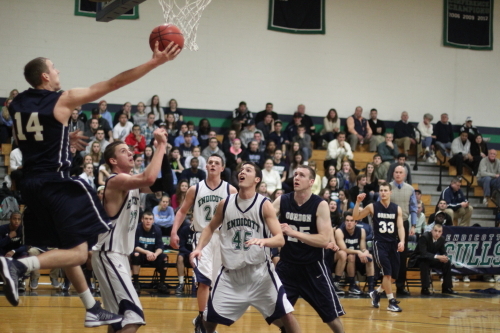 (Wenham) In the first meeting, Gordon edged Salve Regina (64-62) very late on a Hans Miersma putback game winner. Nothing close to that happened this time around at Gordon. The Scots (18-6 overall / 13-4 in the Commonwealth Coast Conference) had a 52-point second half and routed the Seahawks, 87-64, on Thursday night at the Bennett Center. That makes six straight wins and eleven wins in their last twelve games for the amazing 2012-13 Fighting Scots. Senior David Dempsey had yet another big night for Gordon getting twenty-four points, including sixteen in the second half. The points tonight give him a career total of 1401 and move him into seventh place all-time ahead of Tim Kehoe (1397). 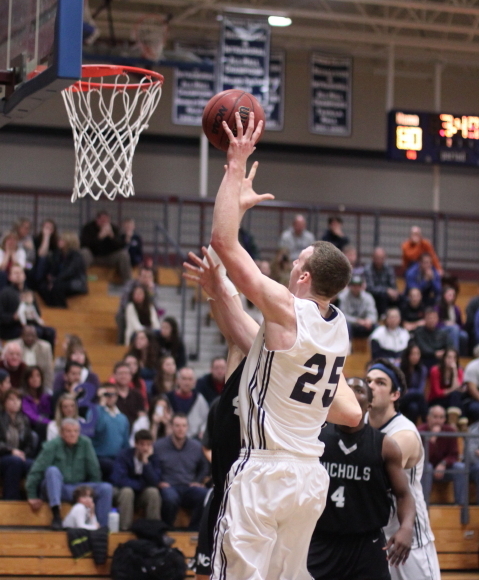 Jon Marstaller is in sixth place with 1490 career points. 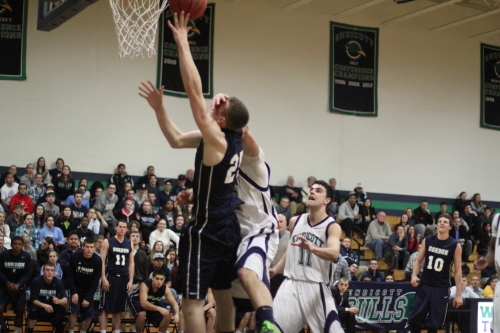 Curry buried out-of-the-tournament Endicott tonight and locked in the top seed in next week’s conference tournament. 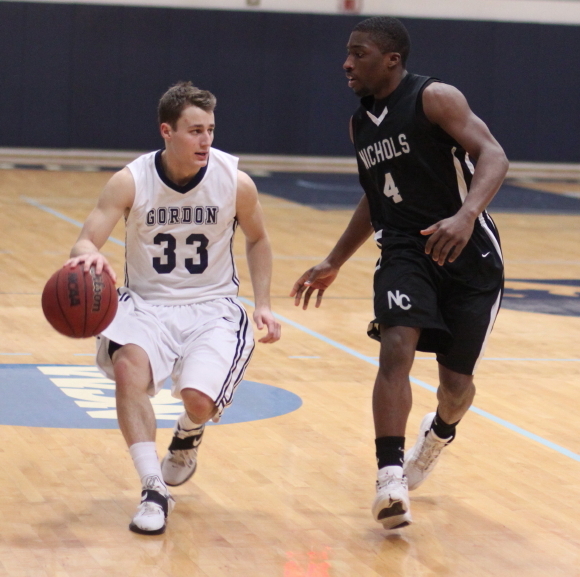 Gordon will have the second seed no matter what they do against Nichols on Saturday at home. 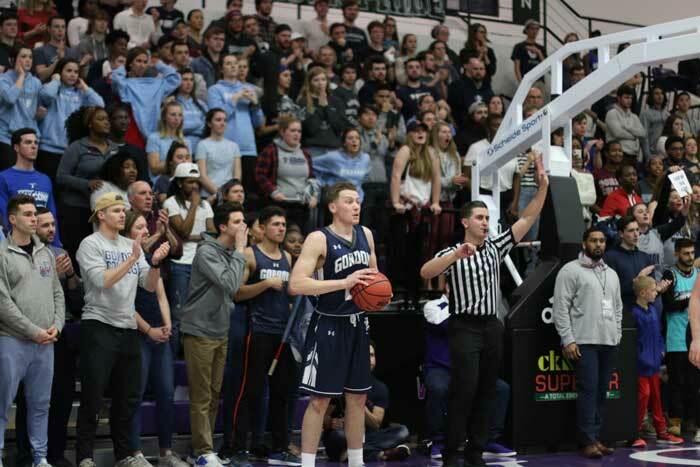 The Scots first-round opponent for Tuesday night’s CCC quarterfinals will be either Nichols, Salve Regina, or Roger Williams depending on what happens this Saturday. In this game, SR (12-12 overall / 8-9 in CCC) was able to recover from a 9-2 Gordon start (including a David Dempsey jam) and take their only lead, 14-13, with nine minutes left in the first half. The Scots rallied to retake the lead, build it to ten points (31-21) and settle for 35-30 halftime advantage. Recalling the first meeting, it was easy to imagine that the second half would be tight and some heroics might be needed at the end to get a victory. Didn’t go that way at all. Gordon shot over 50% and SR less than 40%. The GC lead went to ten (46-36 at 15:42) and the Seahawks would never get closer thereafter. The spread reached sixteen (54-38) and later twenty (69-49) with 6:14 left. On this night, Salve Regina had no second-half answers and most of the second half was relaxing for the Gordon faithful. Two takeaways from this game were that the three referees brought whistles and they knew how to use them! There were fifty-four fouls called and sixty-four free throws shot. Believe me, there was plenty of contact. 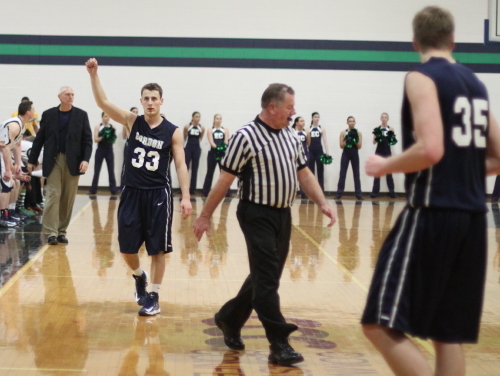 The Seahawks committed thirty fouls and they still were going after the Scots full-court until the end of the game. David Dempsey took the top spot in the Efficiency Stat with a +27. He had three assists and two steals to go with his twenty-four points. Luke Hamilton matched his season-high with fourteen points. He also chased Isiah Pringle around limiting the SR junior to six points. Isiah got a three after Luke was through for the night. Isiah came in with a 16.1 points per game average. Park Thomas (18 points) shot a career-high seventeen free throws and made fourteen of them. 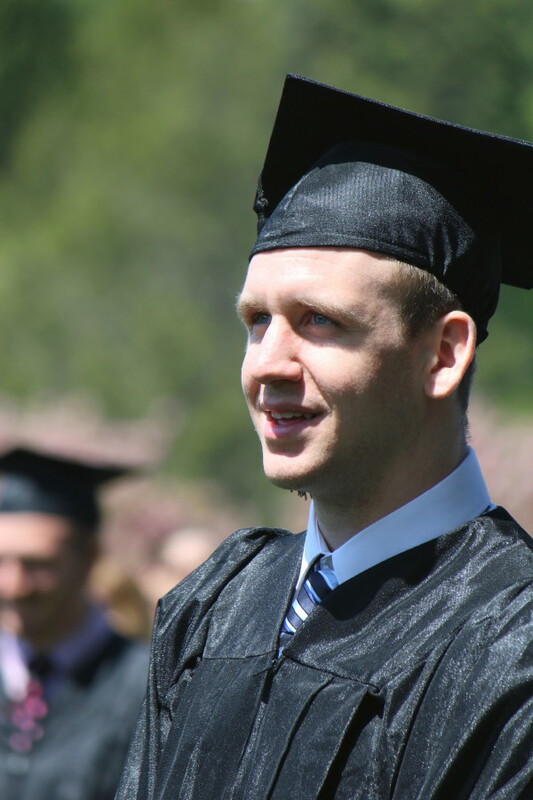 If you had told me that Hans Miersma had two points and four rebounds, I would have asked you, “How much did Gordon lose to Salve Regina by?” But in a season where success doesn’t revolve around one player, Jason Dempsey (nine points/nine rebounds) stepped up and so did Luke Hamilton (fourteen points). 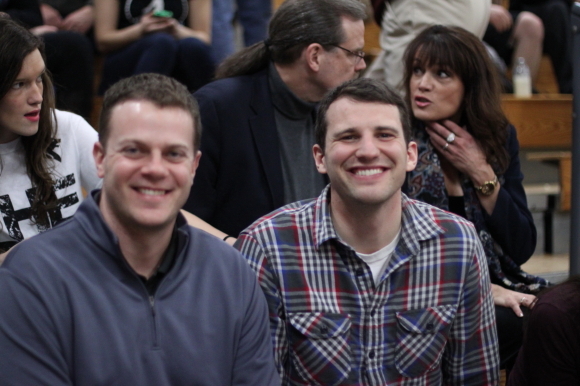 Speaking of Jason, tonight was the first time I ever saw him smile on the court. 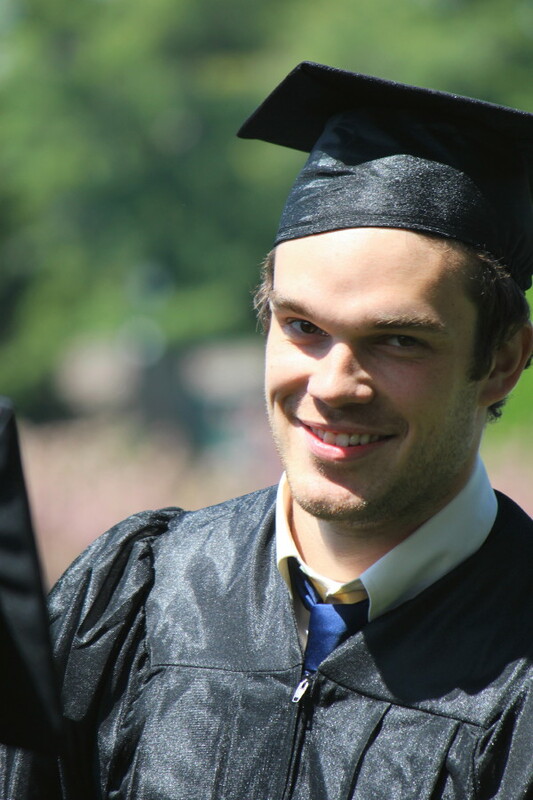 The smirk came right after he made a free throw off the backboard. 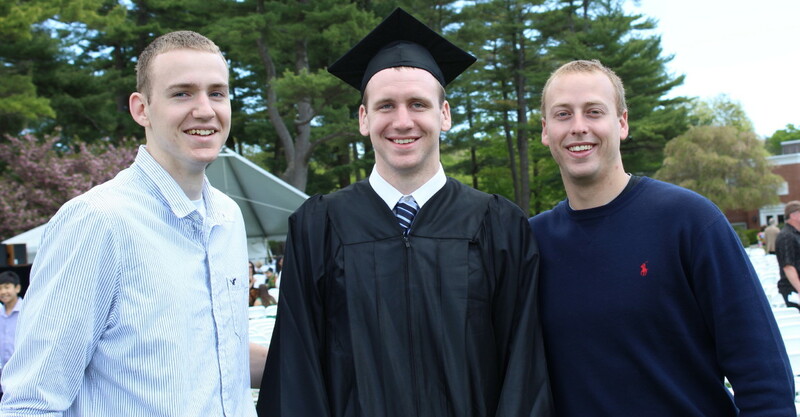 His brother and his on-court teammates were quick to apply some verbal abuse. 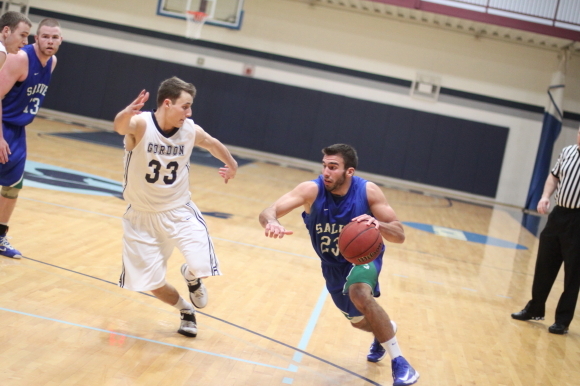 Salve Regina had twenty turnovers (without being pressed) that led to twenty-eight Gordon points. William Smiley (12 points) and Brenden Fowler (11 points) were the top SR scorers. 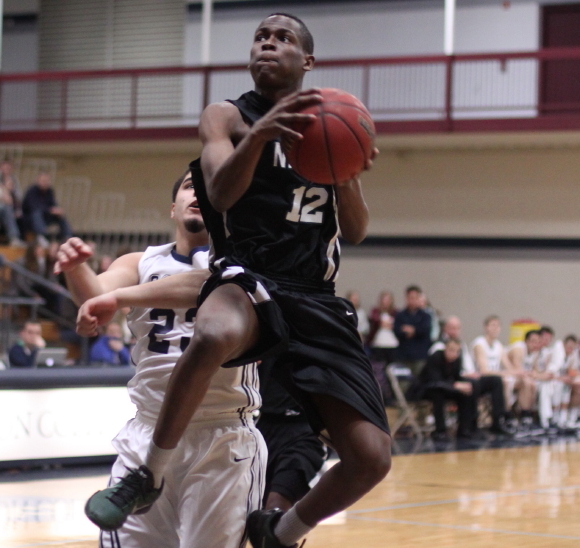 William had thirty-two points on Tuesday night against Nichols. The Scots will face Nichols on Saturday afternoon. 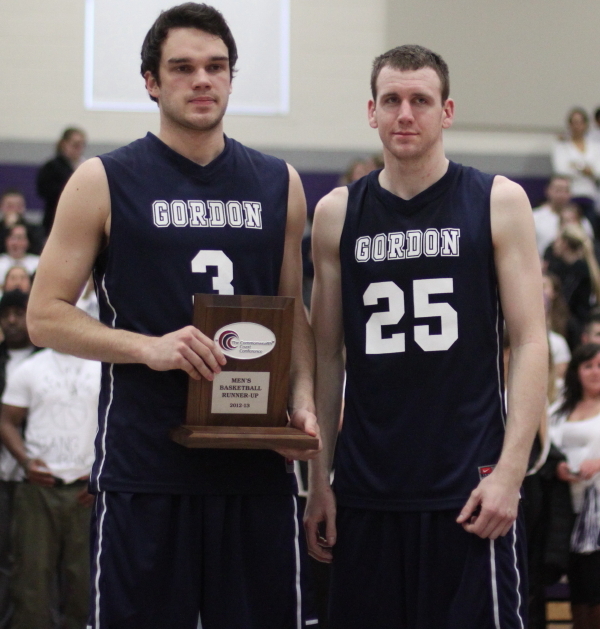 Gordon’s two seniors (David Dempsey and Jordan Kelly) will be honored before the game. If I could get this team to do one thing on Saturday it would be for them to show their appreciation of the fan support right after the game. Showing them that love may help them to remember where you want them to be on Tuesday night when the quarterfinals start. 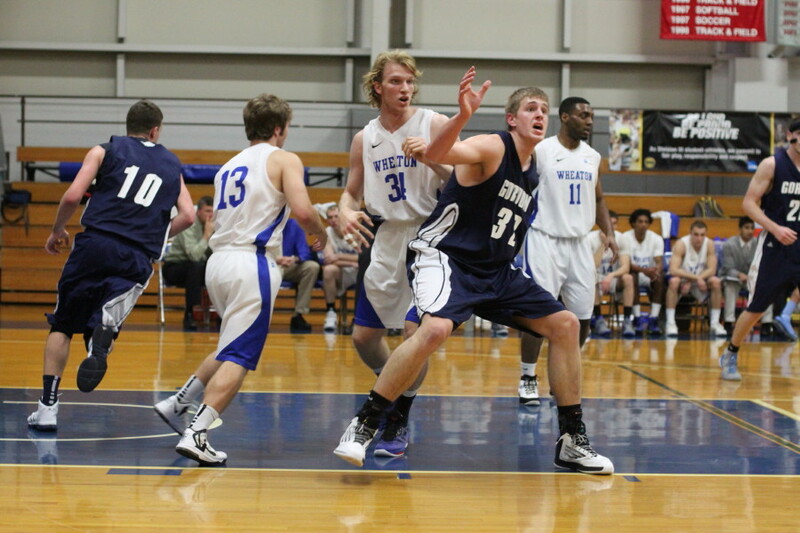 Hans Miersma, shown here against Wheaton, had 15 points, 15 rebounds, 7 blocks, and 3 assists against Wentworth. 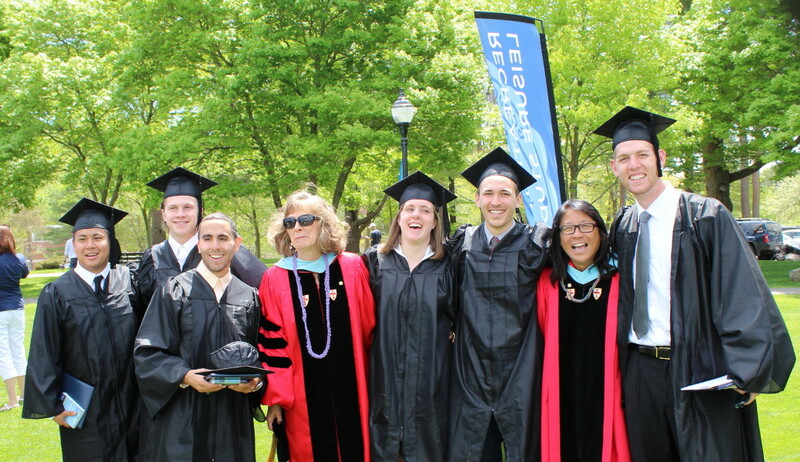 (Newburyport) Don’t wake me up if I’m dreaming this! Gordon (17-6) gets another win and is now assured of at least second place in the Commonwealth Coast Conference tournament that starts on Tuesday (February 19th). This latest edition of good news happened as a result of the Scots defeating Wentworth, 71-58, at Wentworth on Tuesday night. 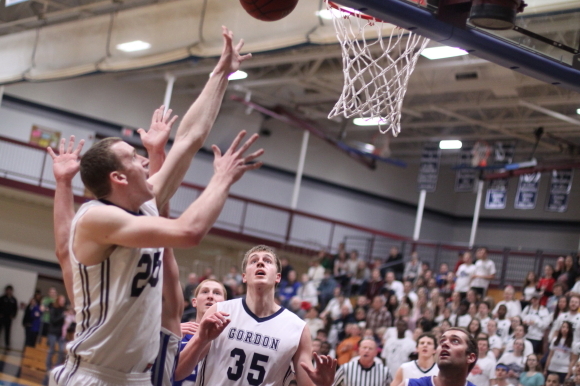 Gordon is a few if’s away from moving into the top spot in the CCC. Curry is the team ahead of Gordon, but after a loss tonight to Eastern Nazarene, the Colonels are 13-3 in the CCC while the Scots are 12-4. To get to the top Gordon will need to win their two remaining games (Salve Regina & Nichols) while Curry will have to drop their final two (Endicott & Wentworth). A tie in the final standings will go in Curry’s favor since they defeated Gordon twice during the regular season. A good idea would be for the Scots to concentrate on their two final opponents and not worry about what Curry does or doesn’t do. The star of this game? Easily Hans Miersma. The 6-9 sophomore put up his best efficiency stat (+37) of the season. The double/double (15 points and 15 rebounds) was in place but he also handed out three assists and had a career-high seven blocks. Plus he never missed a field goal. 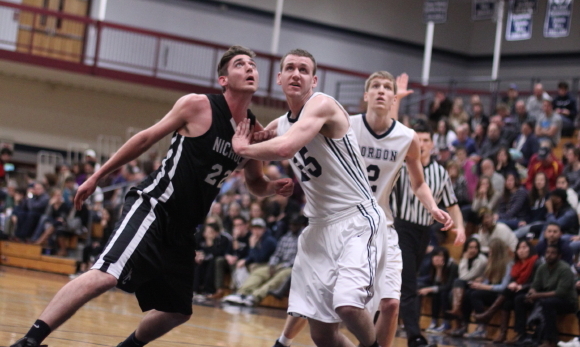 Wentworth (11-7 in the CCC) struggled to get rebounds (Gordon won that battle 40-23) and shooting (36.5%). But despite being down by double figures most of the game, the Leopards put the Scots in the let’s-see-if-they’ll-blink territory with 4:36 left as they closed to six (52-46). However, over the next nearly three minutes, Gordon put together a nice 10-1 package, and up the lead went to, 62-47, and the Scots had the spurt that assured them of a road win. The damage doers in the decisive run were: David Dempsey (jump shot), Hans Miersma (jump hook and tip in), and two free throws each by Park Thomas and Alex Carnes. Wentworth was just the latest team to make a run at the Scots late and discover that the team from Wenham can be special in crunch time. Gordon made a significant breakaway early in this game, scoring twelve unanswered points to turn a 4-3 deficit into a 15-4 advantage in less than four minutes. Three’s by Park Thomas (10 points) and Luke Hamilton, two layups by David Dempsey (14 points), and a Hans Miersma layup gave the Scots the twelve points. 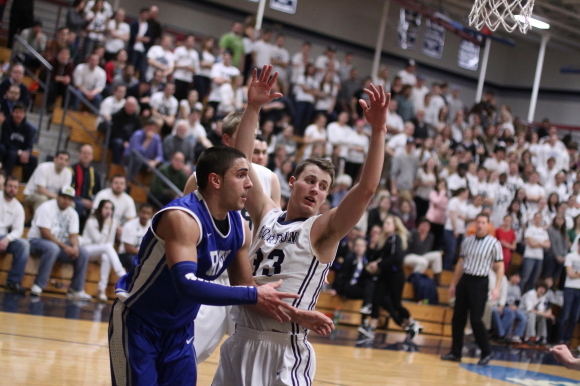 Colin Johnson paced Wentworth with fourteen points. 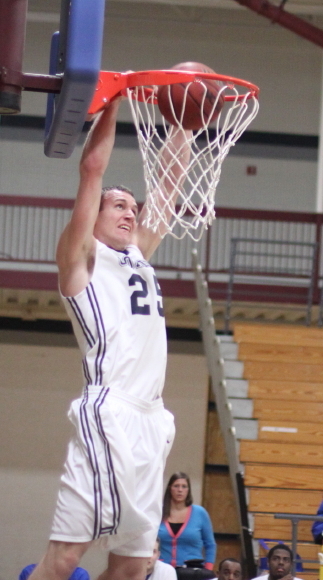 Alex Carnes had fourteen points and six rebounds. 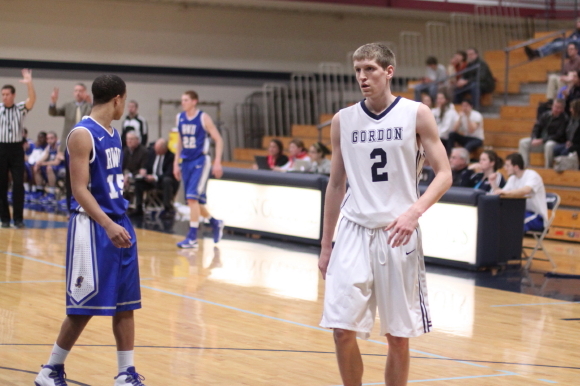 Alex didn’t play in Gordon’s 66-53 win over Wentworth at Gordon in December. 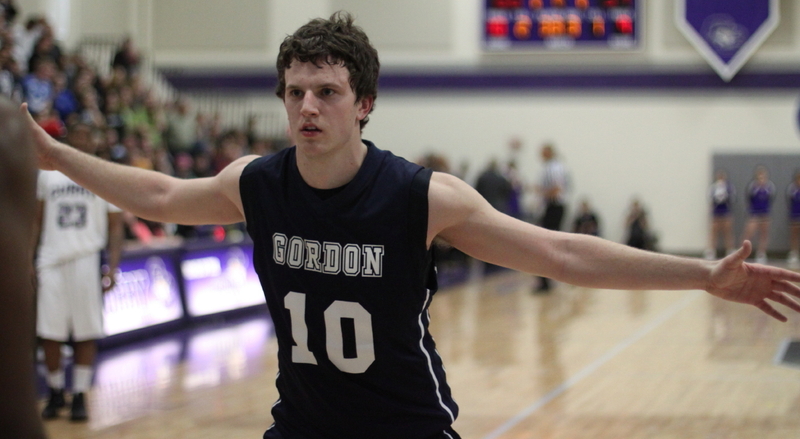 Gordon has won five straight and ten of their last eleven. Who saw such a terrific season coming?? 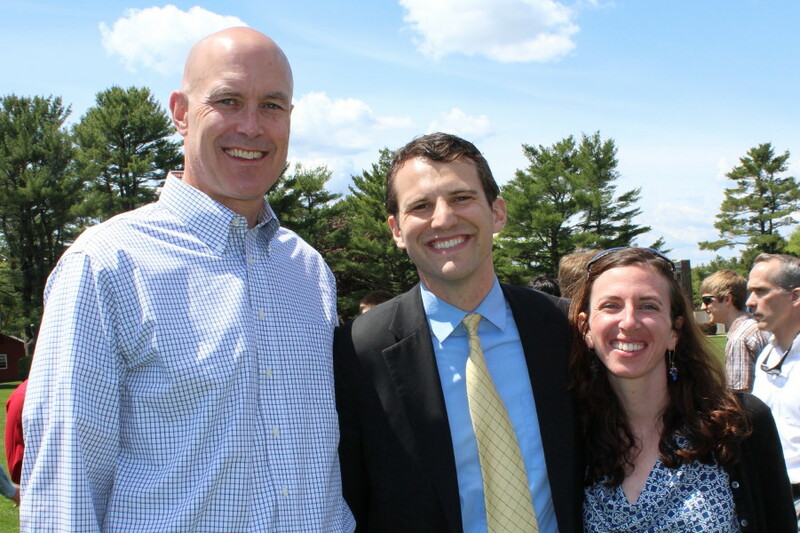 The video feed on the Wentworth website was outstanding. The announcer was excellent. The score was posted and the time was visible. What struck me as ironic was that at a school noted for its technology the clock would be such a problem. 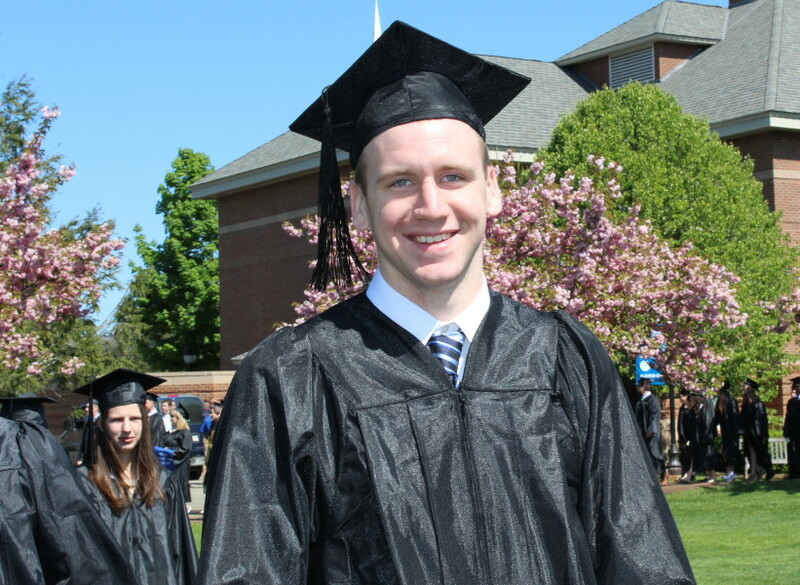 Salve Regina comes to the Bennett Center on Thursday night (7:30PM). The Scots narrowly won the first meeting. 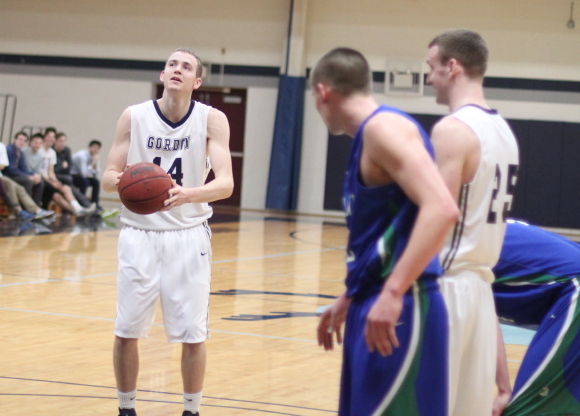 Gordon (16-6) swept the season series with Endicott (9-13) defeating the Gulls, 72-59, on Wednesday night in Commonwealth Coast Conference action. Hans Miersma (20 points and 13 rebounds) was the dominating player in the game. 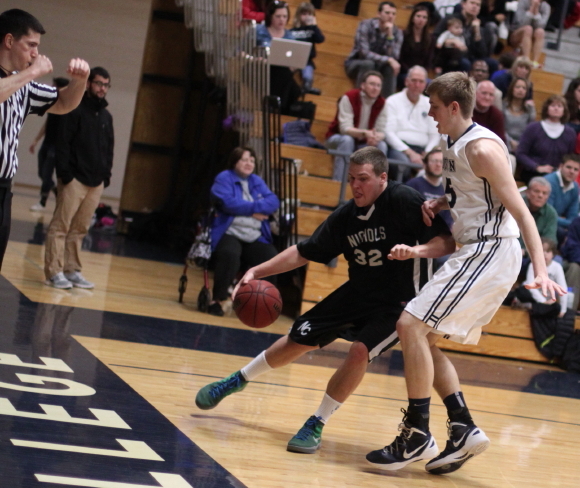 The 6-9 sophomore was able to get the ball in the sweet spot down near the block many times and made Endicott pay. 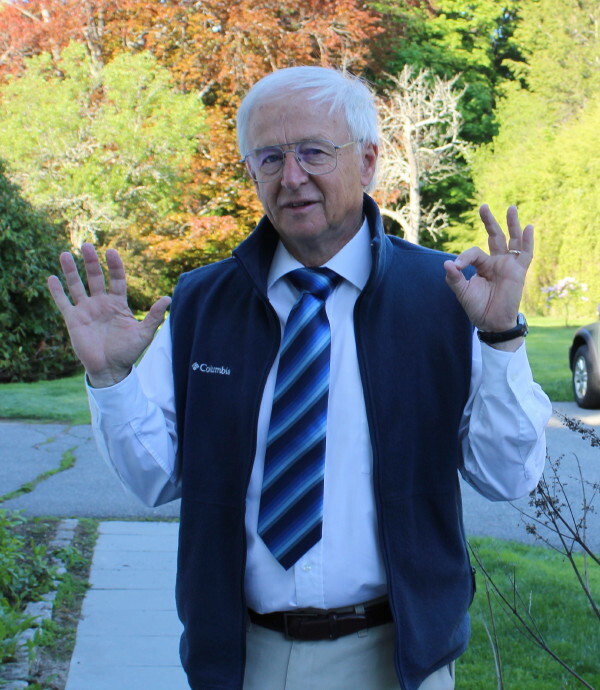 Hans had thirteen points in the second half and teammate David Dempsey had twelve points. Both those contributions were needed as the Gulls made things interesting late. But that scary free throw shooting aside, Gordon had the right answers when EC came close a couple of times in the second half. In one such instance, the Scots had a fifteen point lead (40-25) with 14 ½ minutes left but the Gulls ran ten straight points (two Nick Mazzotta free throws, Lance Greene layup, Bennett Knowlton three, and Dan Powers three) to sprint to within five (40-35) with 12 minutes left. 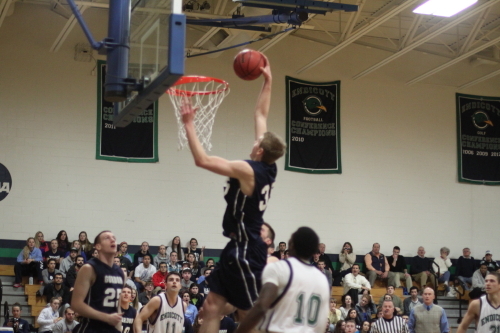 Another time, Endicott trailed only, 58-52, with 4 minutes left. Let’s face it, the Gulls were a couple of made shots away from pulling even. However, in the next minute a Hans Miersma jumper and a David Dempsey old-fashioned three hoisted the lead back to, 63-52, and finished the Gulls. David Dempsey (18 points and 6 rebounds) had a strong game. His exit with his 4th foul with eight minutes left, and a six-point GC lead, was of concern but his teammates picked up the lack. 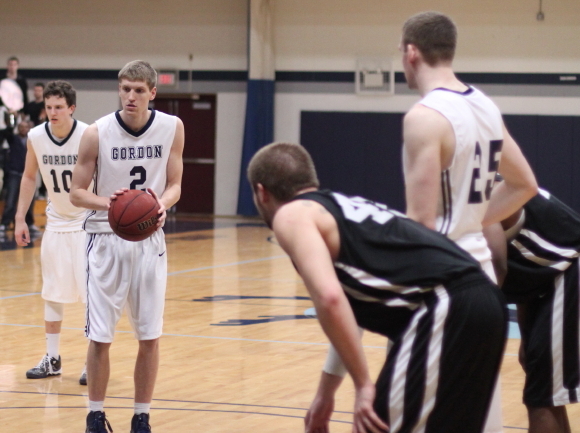 When the 6-5 senior returned to action 2 ½ minutes later the Gordon lead had grown to ten (58-48). 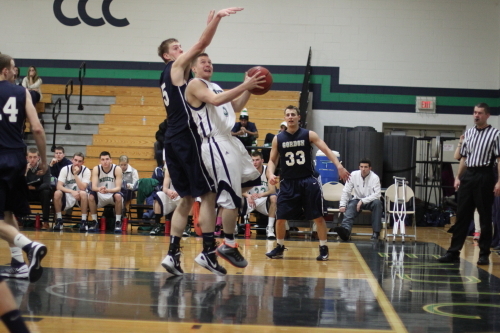 Endicott was done in by poor shooting. They missed forty-two shots and ended up at 32.3%. Good defense by Gordon? Maybe, but the Gulls appeared to be intimidated by the Gordon shot blockers and settled often for low-percentage outside shots rather than driving. 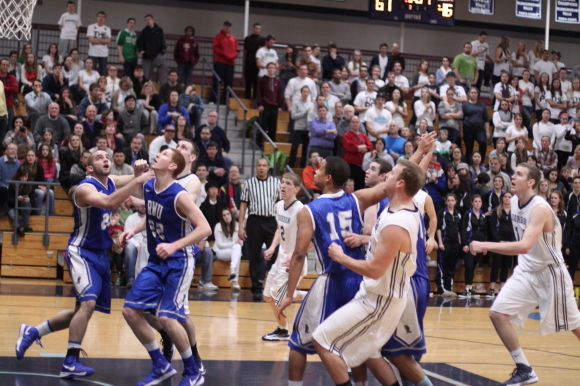 One particular segment of poor shooting put Endicott in a hole they never recovered from. This segment stretched from 2:59 of the first half to 18:30 of the second half. Let’s call it 4 ½ minutes. The Gulls came into those 4 ½ minutes leading, 20-17. When it was over they were down 32-22. That’s a 15-2 run for those of you keeping track at home. The Gulls made just one-of-nine shot attempts during those unproductive minutes. Luke Hamilton nailed two 3’s in the breakout time frame. The Gordon victory (11-4 in the CCC) enables the Scots to keep pace with Wentworth in second place in the CCC. Curry continues to win. They have only two CCC losses with three games left. They also hold the tie-breaker over GC because they defeated Gordon twice. 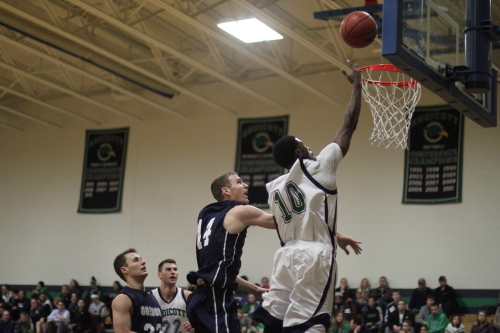 Meanwhile, Endicott (4-11 in the CCC) is in trouble at the other end of the standings. They are currently in 9th place and out of the post-season tournament. It will be difficult to imagine last year’s CCC champions, and the preseason pick to win the CCC this year, not making the tournament. The Scots are back to rolling again. They’ve won four straight and nine of their last ten. They are 15-2 since the loss to Lynchburg in December. 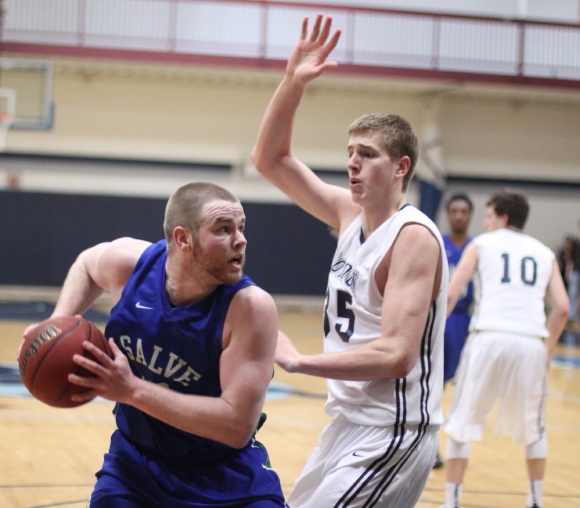 Ahead, weather permitting, is a Saturday game with Salve Regina at the Bennett Center. That matchup will be followed with a trip to Wentworth on Tuesday night and the regular season finisher at home on Saturday against Nichols. Where did the season go? It was great to witness yet another game in which the opponent made a strong second-half run yet the Scots found ways to persevere and get a win. The best part is that no individual player stands out in these crunch-time responses game after game. 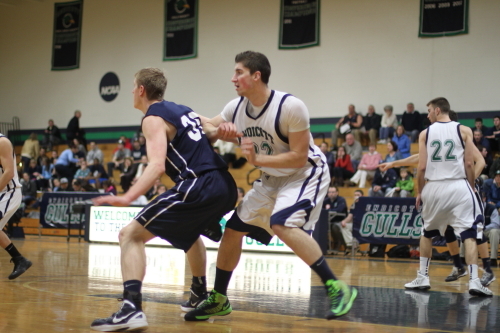 Who can forget the sixteen points Shaun Roach had in the first Endicott game to hold off the Gulls? Shaun played just a few minutes in the rematch but up stepped Hans and David and Park Thomas (14 points and 5 assists) to carry home the win in the second half. 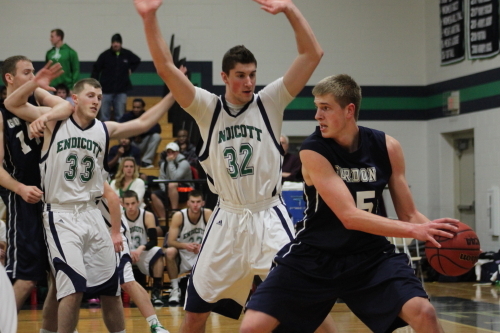 Lance Greene (13 points) and Lachlan Magee (12 points) paced Endicott. 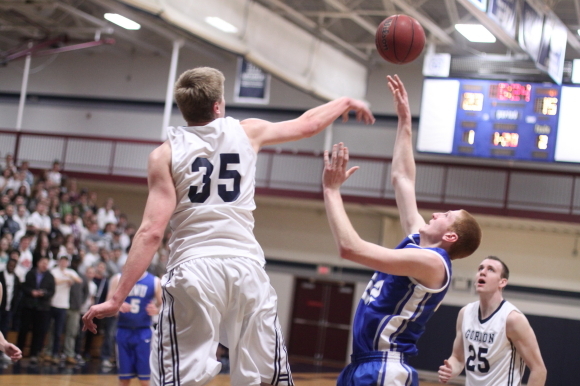 John Henault (9 points) had an off night hitting just 3-of-14 shots. 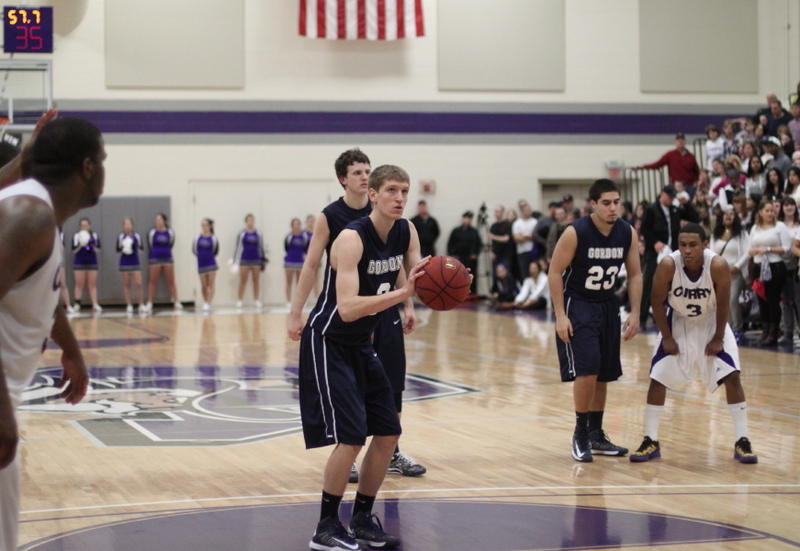 John is 4th in the CCC in scoring averaging 16 points per game. I was impressed with the precision of the Endicott dance team. The Gulls also had a pretty good band. The Scots shot 58% in the second half.